Larissa Explains It All...: NYC, What is it About You? Soon enough, my sissy and her friends B2 and Ryan showed up as Debbie and I were purchasing tickets to "Shrek: The Musical." My favorite Broadway star is Sutton Foster - I have seen all of her starring roles on Broadway. The combination of her and Brian D'Arcy James, whom I have been enchanted with since 1997, lured me to aforementioned musical. Unfortunately, Shrek is a big, green ogre, so I couldn't observe the beauty of the man, although he did serenade me. The biggest bummer of all was that Sutton's understudy was performing. Whilst I felt as if I were watching a true up-and-coming Broadway star, I was disappointed. Can I still say I've seen every musical Sutton has been in? Sad day for me:-( Shrek, was definitely an unexpected pleasure - quite stunning visually with many catchy tunes! The man who played Lord Farquaad stole every scene he was in. I did fall asleep for 5 minutes during a stretch of ballad's - hey, I hadn't slept since 7am the morning before...but seriously...who does that? I hang my head in shame. Next, I checked into our 1-bedroom king suite hotel, The Benjamin - a 4-star treat on Manhattan's East side. The staff were incredible and it was the first 4-star establishment I have walked into and not received a look of, "What are you doing staying here?" I highly recommend this establishment. AND, they have a Pillow Menu! After a quick 45-minute nap, I headed off to "West Side Story." (I think I was half way there before I officially awoke) I'm not typically one for Sondheim, but knew seeing this musical live would be an experience, and it was. This was the start of my overwhelmingly male-heavy cast experience. Of all the shows I attended, I would say the males outnumbered the women on average 3:1. Thursday morning, we headed off to tour Central Park with Debbie, of course making a few stops along 5th Avenue on the way. 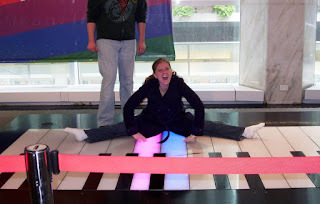 FAO Schwarz calls the name of any "kid at heart," especially the piano from one of the most classic scenes in all of cinema in the movie Big! I tried to play Chopsticks on my own, however my little stems just aren't long enough. If you look at the picture below, you will see that I am most definitely a hot tamale and my sis is just a big sucker :-) Yes, I know I am funny. We finally hit Central Park, where we met up with Debbie for some fun walking the manicured gardens, rowing boats, and feeding a squirrel right out of Debbie's little hand! Debbie needed some gnocchi from Da Nico's in Little Italy, so we hopped on the subway on our way to a feast. Thursday night was South Pacific - I am very lucky to have seen this because it has been playing to sold-out audiences since the previews in spring of '08! Surprisingly, this was also my favorite show of the trip. Not once did I wonder when the next scene was coming or even yawn (which one finds oneself doing a lot on a trip to NYC). The whole cast was incredible - a very strong ensemble. Friday my sister and Ryan took a tour where they discovered a bakery, Magnolia, of magnificent proportions. I don't even like cupcakes, and I loved theirs. They also have these mini-cheesecakes that are by far the best I have ever had in NYC. Forget the expensive slices - go to this bakery on 6th Avenue and 49th for a $4.50 mini-heaven! We also made a run to Serendipity III as one of our favorite treats in NYC is their frozen hot chocolate. While waiting to be seated, we ran over to Dylan's Candy Bar - straight out of the world of Willy Wonka. On a side note, I purchased a new purse in China Town, as I do every time I go to NYC, and as I was sitting in Dylan's new cafe changing out purses, I realized how bedraggled my old purse was. Then it hit me - that was the first purse I had ever purchased ever and in Manhattan. I loved it so much I bought two back in the day, so I decided it was time to retire my first purse (since I still have a replica at home) - kind of as a commemoration of my 10th trip...I don't know why I thought it was some sort of mile-marker experience. Friday night I watched Guys and Dolls from the front row! Lauren Graham from Gilmore Girls fame stars as Miss Adelaide - who knew she could sing? Character voice of course, but she was fantastic. I was also privileged enough to see Oliver Platt's understudy perform the role of Nathan Detroit for the first time. I would have loved to see Platt, but I enjoyed experiencing a first with Adam LeFevre. After the show, B2 showed up because she wanted to meet Lauren Graham. We stuck around the stage door and out she came! I am sorry to say that she really is as beautiful as she appears on TV, and then some. How is that fair? Saturday afternoon we were able to win lottery tickets to Rock of Ages, a new musical with a ton of 80s rock music and 80s cliche craziness. For Idol lovers way back in the Carrie Underwood days, the show starred Constantine Maraulis, a man Simon himself once called, "astonishing." The stage sort of juts out in three places, creating four seats (two on each side) that are pretty much "in" the stage. Ryan and I were sitting in two of those. Talk about up-close and personal! Ryan loves many of the actors in the show, so we hung around after to get autographs and Constantine was kind enough to pose for a picture. I have to say he was one of the most patient stars I have met and was definitely a hit amongst the middle-aged ladies...I wonder how he feels about that? I was mega-impressed with his vocal chops, for any who are wondering. I didn't make it to Riverside Park, the beautiful setting for the sap-tastic scene in, You've Got Mail. The gardens there are to-die-for in the springtime and relaxing to boot. Maybe next time! There never is enough time to do everything I want. Awww, I heart Sondheim. He's my fave. And wow for so many musicals. Shrek the Musical? Who conceives of these things. I mean, I'm sure it went down just fine, but who sits around thinking of ogres in musicals? I never thought you were the type to hold a funeral for your purse. Sounds like you had a blast! I hope your next vacation is this fun.